Home inspections are important as they enable a buyer to learn about the physical attributes of the home. In almost all instances, homes are sold in less in less than perfect condition. Therefore, a buyer needs to be informed about the anticipated costs associated with maintaining the home post-closing. As a result, the Home Inspection Toronto is the important for home buying process. An accredited and experienced golden home inspection professionals investigates the home and writes up the inspection report after the inspection is completed. This detailed document becomes a very important tool in the home buying process. A proper home inspection typically includes an examination of the entire house including. Doors and windows. Roof and exterior walls. Plumbing. Electrical components. Heating and air conditioning systems. Surrounding vegetation of the home and more. Why Home inspection for sellers: It is good to have an inspection done before placing the home on the market. This can significantly increase the visual appeal of a home. Why Home inspection for Buyers: If a home inspection report is not completed by the seller, a Buyer should pursue an inspection to learn about potential problems and upcoming maintenance expenses associated with the home. Value - If the home inspection report identifies problems, the buyer can negotiate for a price that accurately reflects the value of the home. 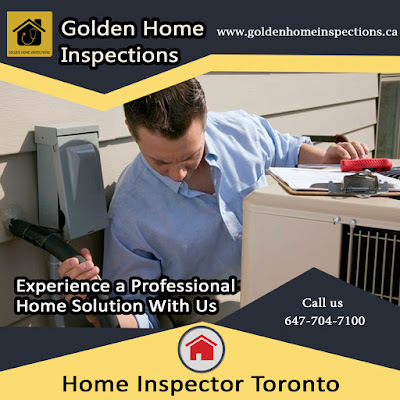 Hire a Toronto Home Inspection professionals from www.goldenhomeinspections.ca to represent your best interests. whether you are a buyer, seller or owner - to ensure the home is safe for you and your family, and that you are fully informed about major upcoming expenses. If you're here, you probably have been notified that a building you own requires a Recertification Inspection. For professional home inspection needs contact 647-704-7100. Why Golden Home Inspection Service? At Golden Home Inspections, your home inspection will be conducted by inspectors with many years of practical building experience in construction, renovations, and restorations. We know what to look for when it comes to home deficiencies. Golden Home Inspections is a proud member of the National Association of Certified Home Inspectors (NACHI), the largest and most respected inspection association in North America! !